You will need more than 1 Hornet kit ….! In his latest decal release, Robert Schneider (www.mc-one.ch) from the “Matterhorn Circle (www.matterhorncircle.ch.vu), has changed his strategy and has opted to have his decals produced by a commercial sprinter, rather than relying on his Alps. For this venture he has chosen to collaborate with Raymond Horwell of Fantasy Printshop, who has an excellent reputation. 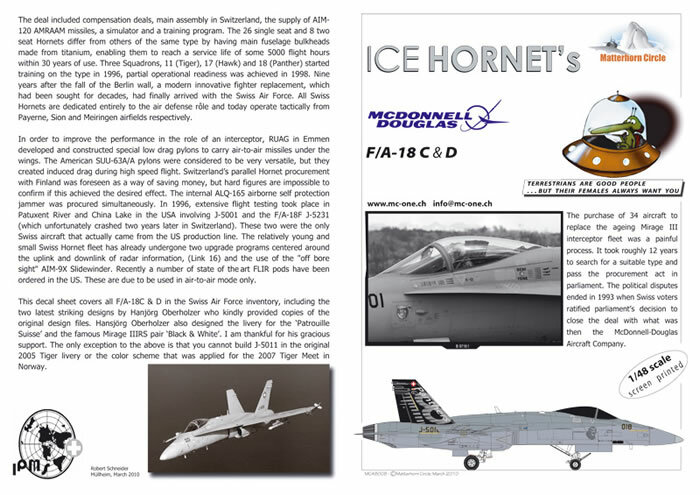 The new sheet deals with the single and twin seat McDonnel Douglas F/A-18 C&D variants as used by the Swiss Air Force, and sufficient markings are provided to cover virtually any aircraft, barring those with special Tiger schemes, which were covered by previous MC-ONE releases. The focus of this sheet is, however, on two F/A-18 C’s with spectacular tail art work, and J-5001, the Swiss RUAG test aircraft, which was put through its paces at Patuxent River in 1996. The decals are offered in 1/72 and 1/48 scale, for which superb kits exist by Academy and Hasegawa, as well as a plethora of aftermarket goodies. Although the Swiss were quick to realize the importance of jet aircraft, the jet age having dawned in Switzerland in the summer of 1946 with the procurement of 3 DH-100 Mk.1 'Vampires' from de Havilland in England, the need to replace its aging Mirage and Hunter fleet was viewed very skeptically by the Swiss public, and necessitated a national referendum in 1993. Only then could the purchase of 34 new jet aircraft, consisting of 26 single seat and 8 twin seat aircraft, be put in motion. In a deal with MDD, main assembly would be carried out by RUAG in Switzerland. A notable achievement of the negotiations was that the Swiss F/A-18’s would be equipped with AIM-120 AMRAAM missiles, a feature normally reserved for fully fledged NATO members. With their fastidious penchant for perfection, RUAG built F/A-18s do subtly differ from their US counterparts by having special low drag under-wing pylons, amongst other items. As mentioned, the first F/A-18 C aircraft, was assembled by MDD at St. Louis, USA, and was tested by the Swiss at Patuxent River in 1996. For their telemetry measurements, F/A-18C J-5001 was adorned with a series of discrete black and white target markings. These are supplied in detail on a small separate decal sheet, as well as detailed 3 view drawings, showing the complicated placements in their entirety. 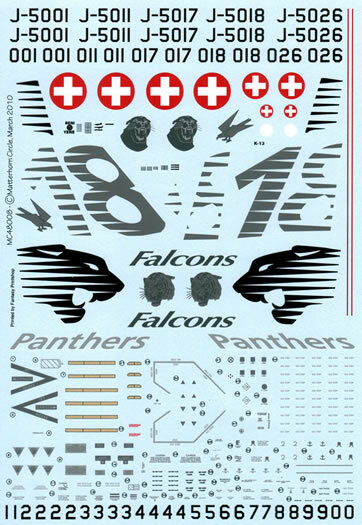 The heart of the decal sheet, however, are two striking schemes, designed by Hansjörg Oberholzer, who has designed a number of striking schemes for the Swiss Air Force, including those of the “Patrouille Suisse” and the famous “Blcck & White” Mirage IIIRS pair. The schemes in question are an ornate Falcon on the tail of J-5017 “Falcon Squadron” and a fetching graphic “18 and Panther head” on J-5018. These aircraft are described in detail on www.mc-one.ch and http://www.amv83.fr/Asm/gallerynortheuropeSuisse.htm, http://www.harnisch-gallery.ch/pn/index.html. Since Hansjörg provided Robert with access to the original airbrush masks used on the real thing, we can rest assured that these schemes are accurate as depicted on this new decal sheet. 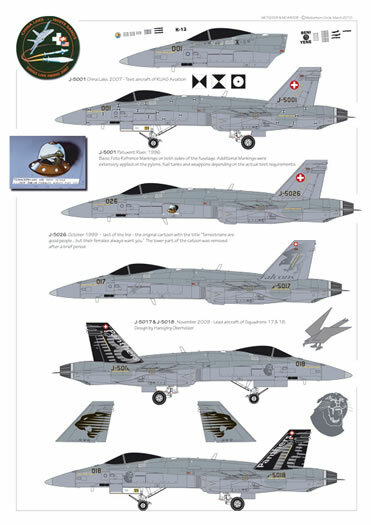 In keeping up their traditions evident on the last Hunter “Robin Hood” and Mirage IIIRS “Mata Hari”, the Swiss Air Force also adorned the last F/A-18C to be assembled by RUAG in Switzerland with a special logo, displaying a small ET in a UFO, with the slogan “ Terrestrians are good people…. but their females always want you”. The possible play on words about pilots and chicks was removed a short while later. This small piece of artwork is provided on the sole ALPS printed sheet. Having been fortunate enough to see Swiss F/A-18s display their craft at epic presentations such as those at Axalp (http://www.youtube.com/watch?v=VJD4KlmF3Ag) or whizzing through the Alps on numerous occasions this new www.mc-one.ch sheet is a very welcome addition to my already bursting decal collection. This is an excellent product, made even better by the help of Fantasy Printshop, and is highly recommended for anybody with a passing interest in this rather exotic small air force. The decal sheet is available directly from: www.mc-one.ch.